We are really spoiled for choice when it comes to picking an interior design style for our homes. Will it be modern lines and sleek surfaces, or perhaps classic furniture and ornately decorated spaces? And let’s not forget the unique beauty and potential that other design styles can add to a space, such as Scandinavian or rustic. But today on homify 360°, we’ve managed to stumble upon a home which flaunts a different look: shabby chic. Yes, that delightful style where furnishings are either chosen for their appearance of age and signs of wear and tear, or where new items are distressed to achieve the appearance of an antique. 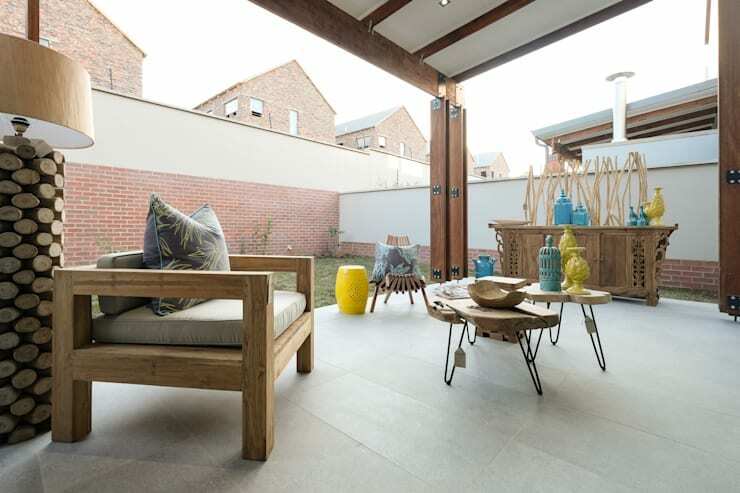 Let’s take a look how this charming Midrand home with a more industrial architectural look manages to successfully blend it with reclaimed teak furniture to produce an overall enchanting style. These interior designers not only opted for lending a stylish touch to the major areas, they also included the smaller, often overlooked spaces, such as here underneath the staircase. 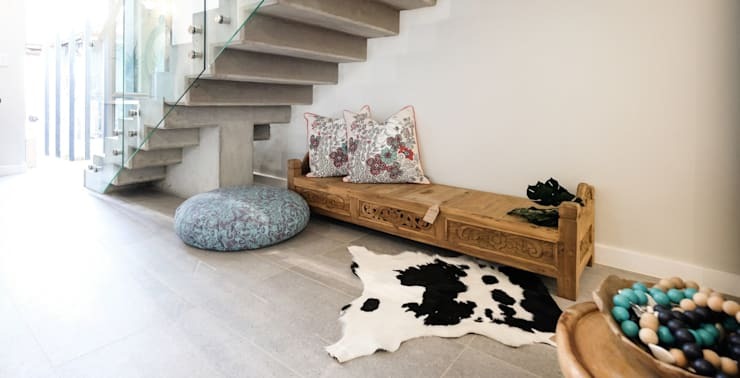 A stunning timber bench (ornately carved, by the way) offers up a comfy little seating spot, complete with plush and patterned pillows and a skin rug. So often, homeowners (and even interior designers) completely overlook the potential that a wall can bring to a space, simply slapping a coat of paint on it and calling it a day. 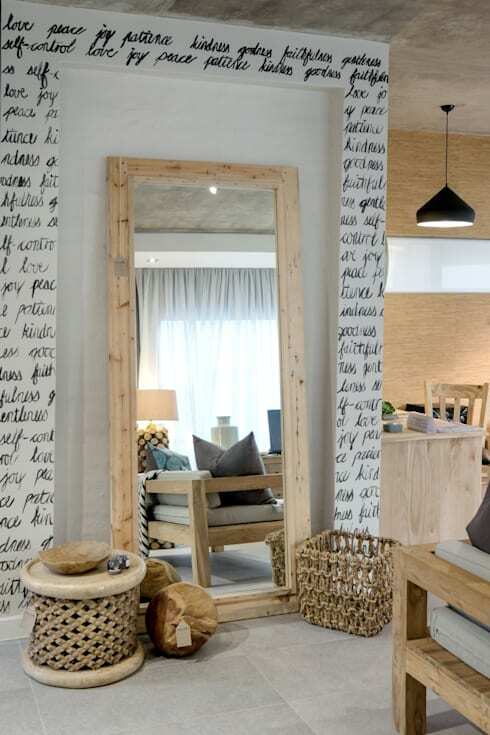 We just love how these experts went a different route by not only allowing a majestic mirror to lean against the wall (visually doubling up the space), but also adorning the surrounding wall surfaces with painted words of optimism. This ensures a monochrome look while also adding a pattern of sorts into the space. As the interiors have been designed in an open-plan layout, the result is a living area which looks much bigger. 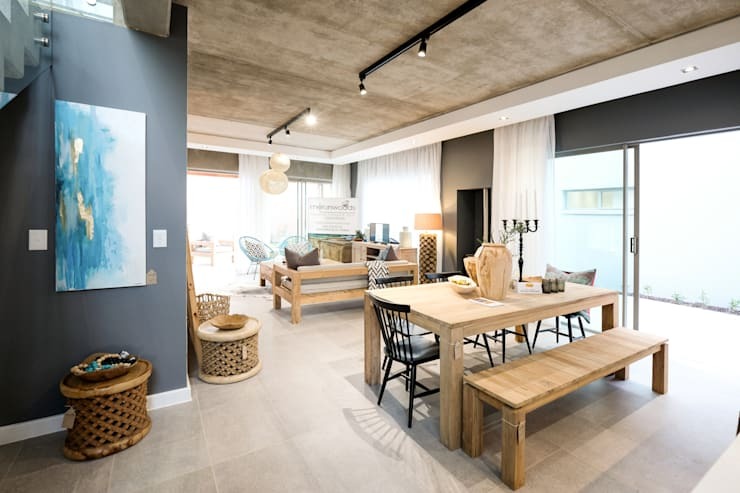 Therefore, a dining area and living room seamlessly blend into one another, both presenting pieces designed in light timber and a strong batch of neutral hues. Notice the exceptional touch achieved by having modern lighting fixtures against a raw concrete (industrial-styled) ceiling. As for the living area, we can pick up a firm commitment to comfort via the plush pillows and numerous soft seating areas. 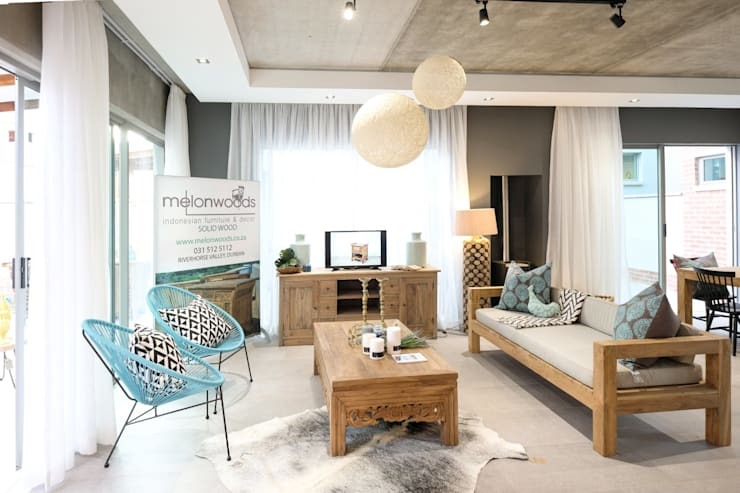 But don’t overlook the beauty factor, which comes through strong via the patterns and hues, most notably the striking visual effect achieved by combining cool blues and earthy browns. Circular ceiling lanterns ensure a visual contrast with the strong shapes and linear style of the interiors, while a glowing batch of light enters via the glass doors and windows. Who says you can’t enjoy style and beauty with your fresh air? This covered terrace certainly disagrees by providing a comfy seating spot as well as a batch of décor pieces in numerous materials and hues. Arctic blues and daffodil yellows offset quite nicely with one another, coming to life against the light neutral backdrop of the colour palette, as well as the soft greens of the garden. A most sensational design project which reminds us, once again, how important the delicate details are! Speaking of terraces, let’s take a look at: 25 ways to avoid those noisy neighbours! We’re curious what you think, so share your thoughts on this design in our comments section below.